< Revamping Your Kitchen Cheaply! Around the back end of last year I hit upon the idea of making my own soaps and handwash. I have naturally sensitive skin and this allowed me to use ingredients that I knew would benefit my skin and leave out those that didn’t, it was perfect! It took me longer than it should of to realise that I could employ a similar rational when it came to my beloved pooch. He (like all dogs) tends to whiff a bit on occasion and I’m fairly intolerant of ‘dog smell’ in my own home. This led to semi frequent bathing with a store bought shampoo. 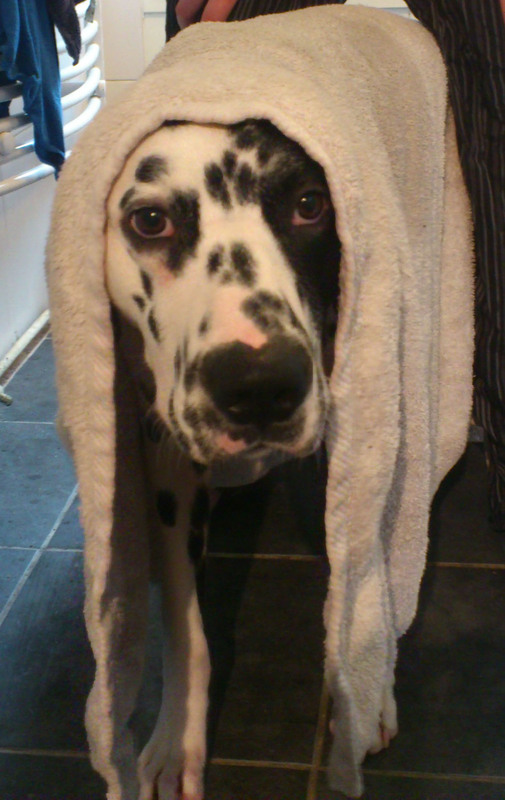 It was heavy and took ages to wash out, then we had to endure wet dog smell for several hours until he was finally dry. It also seemed to strip the moisture from his skin despite being labelled ‘gentle’ and ‘sensitive’. 1. Bath him way less and come to terms with his dogginess. 2. Keep bathing him but his skin would become dry plus the hours of wet dog smell. I went with number three! After reading much on the subject of a dog’s skin PH and scouring my cupboards for ingredients, this is the recipe I followed. It is an amalgamation of several I read, tailored to my little waggy chap. First place the fresh rosemary into a saucepan, cover with boiling water and simmer for about 15 minutes. Leave to cool before straining out the leaves. I actually left mine to cool overnight, you might see an oiling film on the water if you do this. Add the grated soap to your Rosemary water, then the Apple Cider Vinegar. Finally add about a Tbsp of Cocoa Butter of a few drops of Almond oil. Heat gently until the soap has melted. Pour into a clean bottle. Shower your pup in warm water and then start squeezing your homemade shampoo onto his skin. Mine didn’t lather a huge deal. Rinse thoroughly. Amazing he didn’t even smell when wet!!! His fur felt a little dryer at first but only for an hour or two. He actually dried off really quickly which was a huge bonus. The Apple Cider Vinegar is a natural deodorizer (is there anything Apple Cider Vinegar can’t do!). Apparently you can combine it with water in a spray bottle and use it as an in between bath deodorizer for your dog as well, although I’ve yet to try that one. This entry was posted in Miscellaneous, Tutorials and tagged apple cider vinegar, bath, deodorisor, dog, dog rinse, dog shampoo, homemade, make your own, shampoo, wash. Bookmark the permalink. One Response to Homemade Dog Shampoo! Stopping by to welcome you to Collective Bias! Looks like a great recipe to use, especially when the dog does not smell like a wet dog.